Singletrack is a mix of tight and twisty, rooty with a few technical features mixed in. Singletrack is currently around 3 miles with more trail being added yearly. Beginner sections include double track XC Ski trail and Stingletrack rides at an intermediate level with some advanced features added in. Trail is well signed when following the singletrack and rides counter clockwise from the parking lot. See web for updated info and map. 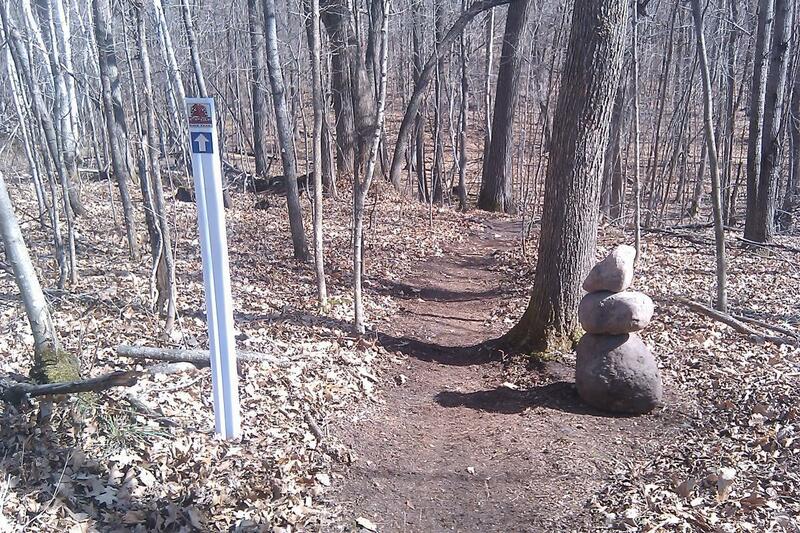 Review: A professionally designed and maintained system of trails. Once in the woods the trails are marked extremely well so you always know where you are located and can easily use map to get to the trails you want to hit. Review: Very enjoyable semi technical xc trail. Rooty sections, lots of hairpins, some challenging climbs. Review: The trail is technical with lots of roots and rocks. Some big climbs. They've added ladder bridges on the trail, and that has made it so much better. Overall it's a great trail and can't wait for the new trails that are going to be built next year. Review: A dedicated group of individuals has logged some time on the trail this spring, adding some really cool features to enhance the experience. More work is planned and I cannot wait to see how this trail will link to the new trail system at Detroit Mountain. If you are in lakes country, you MUST give this trail a run. Review: I rode this today with my son. I am admittedly a novice, and this was my son's first time out, but we had a great ride. We did get lost once, but found the trail again further along - they could use some more signage, but overall it was pretty good. The leaves were also covering the trail, which made it difficult to see at times. Overall, it's a great trail. There are some nice wider open parts (not ski trails) that flow fairly well, and some tighter technical parts. It was greasy when I was out there, so I look forward to trying it again next summer when it's a little dryer. I would recommend this for a quick ride or maybe twice around for a fun couple hours of riding. I also look forward to the coming improvements! Review: I just did this trail today with my son. I am admittedly a novice on mountain bikes, and it was my son's first time. Most of the trail was very nice, not too difficult, however we did find ourselves on the "Most Difficult" section, and it proved to be a big challenge. Overall, this trails is a fun short ride, or if you want, go around it twice. Sections of it are more on the technical end, but there are sections that flow pretty well, too. I look forward to riding it more. Review: Great new section has opened! I have been able to link together a loop of about 3.8 miles. Two loops makes for a great day. I like to go once in each direction for variety. Very thankful for such a great trail 5 minutes from my door! Review: Great trail for area riders. Fun singletrack. Appreciate the work that has been invested in the trail. New sections being added. Excited to see what will be added next. Review: Tight & Twisty Classic Singletrack with a mix of technical features to keep it legit. With more Fun stuff to be built in the near future. Mountain View Singletrack MTB Trail 4.13 out of 5 based on 10 ratings. 10 user reviews.